Black "Max Grip Silica" compound optimised for wet weather adhesion, low temperatures and extended tread life. I love continental tyres their quality is evident from opening the box. The only problem is the price so to save a few quid and not get the box is a no brainer. Save money and help environment a tiny bit. The tyres themselves a nice free running and bombproof, as you'd expect, easy to fit and will give me a season but that is realative to how much you ride. Just replaced these with another set. After 5000Klm and some very rough roads, these tyres have held up very well. Highly recommended tyre. Great all weather tyre. Feel a lot more solid on the road. Second pair - last ones did 8,000 miles and I've done 1,500 on these. These tyres are magnificent - stick to the road in the wet - and not one puncture in 9,500 miles of East-Anglian pot-holes. Look good too. I`ve only done 200 miles on these so it might be too early to comment but I`ve had no punctures and the grip is really impressive. I had some bontragers on before these and I thought they were ok but the difference is night and day the continentals made my trek feel so smooth and confidence inspiring, they were worth every penny. I will buy these again. Always happy when I`m riding on continental. Glad to be back after thinking I could save money on other cheaper brands. These tyres are a work of art and have a nice feel through corners. So far, happy with my purchase. Faster rolling than my previous tyres but still have some grip. Struggled to get them on initially but there is an online video showing how to fit "difficult" tyres - now can get them on in a couple of minutes without tyre levers ! These are the best winter and commuting tyres I have found. They have good grip in all weather and have very good puncture resistance. I use them on my winter and commuting bike and GP4000s ii on my weekend bike. My last pair of 4 season lasted for 3 years of commuting 12 miles a day! Perfect tire. I rode over 2,000 km and it did not give me problems. One of the best. I always use them in the race. Never let you down. Thanks Merlin for fast and safe transportation. Really great tyre, its appropriate for winter months and had good roadholding. You can trust your tyres in high speeds when its raining. Also useful for other seasons like its name :) And has a good rolling resistance. The most sturdy of all training tyres out there. Grip is very tight on the road, the best I have had so far. Great tyre so far, coped really well with the roads of Brittany. Plus great delivery speed and tracking. Would definitely order through Merlin again. Got these for the first time to change my previously used GP4000II S. Continental are excellent bicycle tyres, long lasting and with the Vectran anti-puncture tech you get zero punctures. Usually inflate to 110/115 psi. Quick delivery. Great product at an unbeatable price. Perfect for cycling in all weathers. Rolls well and makes me confident even on wet conditions. Excellent winter tyre. Looks good and has great grip. Not exactly cheap at almost 35 euros each (not that there was anything wrong with Merlin's pricing- this is what they go for) but they were the easiest to fit tires I have ever encountered. So easy, I thought I had bought them oversized at first. Grip is the best I have ever had on my road bike. Beats out any summer tire I have used and also the heavy non-foldable Decthlon 'puncture protect' tires I have used a couple of pairs of over the last winters. If they hold up well I'd probably buy another pair. Not had a lot of chance to use much yet, but hoping they are like the set I have on my other bike which have done 4500 miles with 1 puncture. Good grip in all conditions and roll well. Good price and delivery on time. Trying these out for the first time as I usually use gatorskins but fancied something a bit more grippy with the same puncture protection for winter bike and my part time commuter to work, maybe a bit early for a review after only 200 miles but so far so good. Bought on the basis of reviews that it provides good grip, especially in winter - so far, so good. The best tyre for long distance. Resistant to punctures and excellent rolling. Arrived to ireland in 2 working days, have only gotten out on 2 40km ish rides but both were in the rain and the levels of grip whilst cornering is astounding, really gives alot of confidence to enter corners faster than my previous Vittoria rubinos. Great traction for the Israeli winter, where occasional rain raises oils to the surface, and where the sidewalks have many fallen leaves. Neumáticos de calidad súper , precio muy bueno en Merlyn y envío y entrega correctos. Fantastic tyres, great grip in the wet. The 28mm hugely improve ride comfort. The best tyre to get you through the winter months. Outstanding grip and puncture protection. These tyres are a must for winter commute in Northern Ireland, especially in the back country lanes. I previously owned a pair of these GP 4 season tyres, but I had to replace due to wear and tear after 2 years of winter abuse. never had a puncture. I have used these again for the last 2 weeks in rain and roads covered in shale and stones, still going strong. 10 out of 10. Worth every pound. Many other tires lose traction in rain at +3 degrees. With those I can almost carelessly cross wet tram tracks without a risk of wipe out. I haven't experienced any punctures either. Can`t fault these tyres for winters use, decent rolling resistance and durable. Top quality tyres, bought these to have when my present 4 seasons finally need replacing. Nearly 5,000Kms. on them and not one flat. These are my go-to tyre as I have not found anything to come close to them. Great price and service as usual. Grand Prix 4 season tyres are super puncture resistant. I would recommend highly! Great autumn and winter tyre. Provides the reassurance of better grip (both in the dry and wet) as well as decent puncture protection. These tyres tend to last me at least two UK autumns and winters. Just what I ordered. They are great tires for hotter climates and are virtually flat proof. Excelent tyre and grip, nice performance. Seem lighter than my usual winter tyre the ever reliable Gatorskin, so hoping these offer similar level of puncture resistance. Time will tell. Great tires. Bought for fall/winter riding and happy so far. My go to tyres for the last 4 winters. Hard wearing highly puncture resistant and Great in the wet. What more do you want? Ah yes...... Best price at Merlin! Best tyres ever, with our 2 bikes we used to get punctures every few weeks, now we've had 1 puncture in 2 years since using them with more miles ridden. Excellent tyre for winter use. Sticky, looks nice although a little noisy. Gives confidence in the corners. Chunkier version of the summer tyres which recently ripped on local country lanes. Have done a couple of 50 mile mass start events on them so far, comfortable and good on roads of very mixed condition. These are my goto tyres and this was a reorder to replace my old ones which had 7,300Kms with no flats. Really nice tyre, wish I'd put these on from the start, good tight fit, feels really solid on the rim and strong construction. I will buy another of these for the front wheel in time. All bikes should have one of these on the back wheel. Hand made as well so really good value. Strong robust tyre. Maybe the best tires for a road bike, I've been buying them for the last 5 years, they're super reliable. Whatever the road condition, or the pavement. They last a lot. They have a bit more friction, but they're reliable for long rides. Change from Cont. 23 Gatorskin to 25 4 Season for winter riding. Seems to ride slightly smoother with better road contact on bends. Would recommend width 25mm. Was OK to install using tyre levers. So far so good. Great grip but not made for off-road or even rough sealed roads (punctured 4 times in almost as many dirt road outings). If you keep these tires on sealed roads their puncture resistance is ok (punctured once only in a year of regular usage). I have been riding on these tyres for some time now and it was time to replace them with a new set. These tyres are very robust and last a long time whilst not being too heavy or not losing grip throughout their long life. These are great tyres for a variety of uses especially commuting or sportive rides. As everyone else said very durable, hardly get punctures, been buying these again and again for years. I researched tires heavily and these tires are well rated for weight, rolling resistance, and puncture resistance. Plus they aren't pure slicks as they have some minimal grooving to help in wetter environments. Overall these tires were a no-brainer and worth a little extra $$. Great Tyres. Have always used GP4000 tyres but switched to Grand Prix 4 Seasons last year. They are easily a better tyre for all weather conditions than the GP4000 and in winter they don't cut up like the GP4000'S. Good quality all year round tyre! No punctures in my last set of these! And easy to fit. I've always bought cheaper winter tyres before; usually high quality, but heavily discounted. This time I bit the bullet & bought these, based to recommendation & reviews. Only done a couple of short rides, but first impressions are they are light, responsive, very grippy & have an excellent ride quality. Only time will tell whether they are puncture resistance and worth the money. Very good tyres, light, puncture resist and very good grip. Had this pair for almost a year, riding 20km a day, this is my second pair. Good winter tyres. I normally race GP4000IIs tyres so these are the logical choice for winter months. The softer compound wears a bit quicker that other tyres but give the wet weather grip. Tests show that these tyres have the same puncture resistance as Gatorskins but much better adhesion on wet tarmac. Just wished you could get the 32mm versions more easily. 25mm measures 26.5mm width on 17.5mm internal width rim. Strong tire for all conditions, with puncture resistant features that don't come with a big speed price. Ultra durable for winter riding. Great as ever. Best winter tyre for me hands down. Excellent tyres - hand made in Germany. Not as fast as the GP4000, however far better when it comes to puncture protection. These tires offer a great grip in dry and wet conditions. I have use them for less than 100 miles but the grip to road is superior to my previous ones. They provide better grip and in result I feel more confident in my ride. Tougher with softer rubber than the Conti 4000s that I've used since start of summer. This is my goto winter rubber. Always use these, for me they give me confidence going downhill at speed and round bends the grip on the road is always there. These tyres have given me confidence on slippery back roads and on a ride I recently went on where there was a lot of snow on the road on a long climb. Cornering on wet roads gives you a lot of confidence and haven`t had a puncture yet. What can I say - the best all-season 700c tyre there is. These are my cold weather tire; I switch to 4000s in spring and summer. They work very well and I've gotten as much as 3500 miles out of them in commuting and recreational riding. Nice tires for training. I have been using these for quite a while and will continue to use. Really good price as well. I have used these tires since moving to the southern US. They are durable and almost flat proof except when they pick up a wire that is hard to find in the tire. For someone who has cycled for more than 7 years now I can say that Continental Grand Prix 4 seasons are the best tires I used so far. Indeed a bit heavier but since I am not competing it is less important. They easily last 8,000 - 9,000 km. This time the price was very attractive. Only about 150 km so far but they perform nicely. and I expect to keep them on throughout the winter. I expected to maybe see some laboring on the hills with these "all season" tyres but haven't seen any so far. Great all around tire. Very smooth ride in all conditions. Can't comment on durability yet but so far extremely happy, wished I purchased these sooner. Dependable tyre that I use in winter instead of GP4000S II's as it has a thicker side wall & more puncture protection. Zero punctures last winter! Great tyres. Really good price. These are replacing the same pair from last year. Brilliant for riding through the winter. I'm not a commuter but head out with the club most weeks. Excellent puncture resistance keeps me dry and warm! Treated myself to a new set of wheels and agonised over what tyres to fit. Heading into the winter and with a few good reviews from my friends I went for the GP 4 Seasons. Probably a tad more expensive than I would have liked but so far they are living up to their hype. Grippy, fast and I have a lot of confidence in them. Will see how they last over the next few months. Best tires yet. Good puncture resistance but very supple and sure footed. Perfect tire for long training rides and double centuries. I have more than 4k miles on my current front tire and it should go another 2k at least. Rear tire lasts about 2.3k miles. Most of my riding is in the hills and mountains. Have been really happy with these tires so far. Seem very solid and sturdy. I have ridden in the rain with them a few times and these seem to grip well too, which is why I got them. No flats so far! Great tire, I commute on this daily in Seattle. They roll great in the summer and grip well in the wet winters. Using these in a 700x25 after GP4000S for the autumn & winter seasons. Ride just as well, rolling resistance wise. Stronger tread & sidewall ideal for the rough/wet roads. This is my 2nd set now as the first where that good. Finally found a trye that won't break the bank and are really good. Changed to 4 season from 4000s for training all year round and I haven't regretted it at all. Looks cool at the same time. Fantastic tyre, a little heavier than the 4000s but durability and puncture resistance makes it a great all year long tyre. They're Continentials. What more needs said? They are tough and last forever. Gritty roads? No problem. Slick roads? No problem. I switched from Conti's to another brand that lasted 4 months. Never do that again. Quite the best Winter tyre; Training tyre; Fast Does-Anything Tyre I have ever used; You can get faster but at the cost of either reliability or grip is less than perfect conditions (like we ride all the time). Great tires (28) for my go-everywhere bike. I got 5000 km out of the rear and the front is still ok. I use this on the road and sometimes on gravel and single track. Only one flat ever. This is a replacement for the same which after about 3000 steep miles on the rear had worn out. Confidence giving level of grip in the wet. I installed these on my new Felt Z5, which had 25 mm, easy to install and works well, I now have 28 mm and a better ride. Good looking tires as well !! Saved my life on the first ride.. was going 40km/h down a wet road, crossed a white line around a corner. I slipped but stayed upright, I'd be in hospital on my old tyres. I'm pleased with my purchase. Decided to go with these because they have a thicker sidewall than the other Contis. Grand Prix 4 season are my go to tyre. A good mix of speed, puncture resistance and comfort. Great product and better price than anywhere local. I use these tires all year round and they are great in all conditions. Pretty good flat protection as well. Only time they did not last was when I got a construction staple in my tire. Other than that they are great till they have worn out. Have commuted through the winter months on these and they're absolutely bomb-proof. I bought these to replace a pair of Schwalbe Luganos. I noticed an immediate improvement because they roll better and the grip on wet and muddy roads is vastly superior. The build quality is ace and I will be using them on my winter trainer/commuter bike (Cannondale aluminium Synapse) so they will get a hammering in all weathers. These are the best all round tyres you can get. Great grip, reasonable puncture resistance and low rolling resistance. I've raced with these tyres. Whats more Merlin offer great service and a good price. After more than three years of continuous riding my back wheel needed a new GP 4 Season in 25mm. In my opinion, they are simply the best and most robust types on the market as their performance even in wet conditions is simply amazing. Best value for money with this deal here as well! Just bought new tyres from yourselves at a very good price. I have ridden 4 Seasons previously and find them excellent. This time I ordered 25s as our roads in the west of Ireland have taken a hammering over the winter. Continental tyres speak for themselves. Only ridden 100 miles or so on these tyres but they definitely seem to roll faster than the stock rubber that came with my bike. Grip in the wet seems better to and perhaps the ride is smoother. Too soon to vouch for the durability and puncture protection but I am a Continental fan so I am hoping the 4 Seasons match the high standards of all the other tyres I've ridden from this brand. First class service from Merlin Cycles, with rapid delivery and bargain price too. I put a pair of GP 4 Seasons on my road bike for the winter conditions and I have had no skidding/sliding during this winter of much rain, and I can ride with confidence. I have however picked up a few nicks in the tread , one being quite deep stretching down onto the side wall. so I purchased a spare tyre from Merlin which at the time was the cheapest and delivered in 2 days. I am pleased with these tyres up to now, longevity is yet to be assessed. Have been using GP4000 25s for the summer, but decided to get these following a puncture in wet conditions. Was hoping for something with a similar feel, but more puncture protection. So far, these are exactly what I was looking for. I got the 28 size, and they feel very similar to 25 GP4000s, and so far (touch wood) no punctures, despite several rides in poor conditions on mud and debri strewn lanes, great stuff. Also, great price from Merlin and reliable delivery as usual. Good balance of durability and puncture resistance. These tires wear faster than the Gatorskins, but will give a better ride. Puncture resistance seems comparable. Been having punctures so thought I would try these. So far excellent. Great training tires, good grip, and rarely have flat issues until I have ridden them 300 miles beyond their expiration date. These tires last and last well beyond where a normal person would change tires based on wear with no increase in flat potential. When they do go though, it's time to change them, but usually at that point I have 2-3 spots that are worn all the way to the inner fabric casing. Great tires. I ride with him yesterday 80km. I don't have problem with the tires. I like them. More tread that GP4000s with no major speed loss that I can notice. They are on my winter bike ready for the wet / winter ahead. My first impression, these tires are handling very good and giving me safe feeling on road. The Conti GP 4x tires are amazing. For training on wet and dry condition. Can't go wrong with these. Simply the best all round training tyre you can buy. This tyre is the perfect way to survive some of the shocking road surfaces we have in the UK. My second round with this tire now and they are awesome. Long lasting and ideal for any road. Only had them on my bike two weeks, but they are a noticeable improvement from my last tires! I came off my bike a few times over the last 6 months due to speeding around corners, and these have definitely helped me in feeling safe to travel at speed again. Excellent tyres. Great handling in wet and dry and very stable. Perfect tyre for training and for touring and being foldable are easy to fit. Have found them to be more hard wearing than the Continental GP4000S which are also excellent tyres. Great tires - really durable and long wearing. No punctures on over 7 months riding on my current primary bike. Putting them on all my bikes. The tires appear to be well made. My initial impression is positive. They were easy to mount and look good. The previous tyre was very good. I think I had two punctures. Rolls well. Lasted nearly 5000 miles (rear) on a bike that I carry stuff on a rack. I also ride rough back roads all year round. The tyre tread split but the inner was ok. However I retired it at that stage. I replaced it with the same tyre. Ordered it Sun night and was at my house on Monday pm. My choice for winter riding, gives a good balance between grip, protection, weight, comfort and speed. Not the cheapest but again not too expensive for what you get. Superb, great price, great product. Easy to fit on the bike and no punctures on a 45 mile ride. Feel slightly slower than my original Luganos but given that they puncture every 2 minutes I'm happy to be a bit slower on the ride if it saves me half an hour fixing a puncture. Delivered within 24hrs on a normal postage! Very quick turnaround can't recommend enough based on that. Love these tyres... Come up a little short of 25mm but otherwise they are fast and light for winter tyres. Five stars. The tires are durable and provide a comfortable ride. Love these tyres. Just replacing my first set after 5000km. Only had one pinch flat in that time on rocky gravel. They are nice and grippy and fast enough. Originally for the winter but I am just using them all year now. My favorite training tire. I have only flatted once using it and that was when I ran a tire about 500km past when the inner casing began showing! I ride about 2000km a month with plenty of gravel and these tires last and keep me rolling instead of fixing flats. Love them. I went the entire length of wear without a flat. I live in Northern California and many of rides include rugged coastal trails with exposed rocks. I can't say enough good things about these tires. An existing favourite of mine, did London Edinburgh London 1400km on them in 2013 with only one puncture. These tires are fantastic for daily road training. The reinforced side walls provide great protection from debris on the road. Best road tire I have found for any pavement that is not maintained well. The only drawback is the tread is designed to work on wet surfaces and so wears a bit quicker than a lot of other armored tires out there. Still, I have ridden through broken glass without any flats. Worth the shorter life. 3 punctures in 2 days of winter commuting using GP4000s, switched to GP 4 season and not had a problem since. Usual Continental quality and incredibly sure footed on wet roads. There is no other Winter Tyre as good as these. Flint proof for the Southdowns and Northern France - lets you get more miles in without those hideous, wet and cold, roadside puncture repairs. I've fitted a pair of these on both my bike and my wife's. Both of us commented that they were a little twitchy at the start, but seemed to clear at the end do a quick 15 mile cycles. Very easy to fit on both bikes, usual Continental quality. Bought a new GP4S to replace a worn one. Can't fault these tyres really, particularly as far as puncture protection goes. I commute 15-20 miles each way on a lot of bad roads with plenty of broken glass and have only suffered one penetrative puncture in 12 months (compared to five in five weeks on the terrible Conti Ultraraces that came on the bike). The tread does seem to cut quite easily, but patently not a lot gets through the Vectran belt. The GP4Ss roll fine and grip is great, even on greasy, wet roads. Pity they don't look a bit sweeter, but that's just vanity. Great Tyre, really robust, no complaints, hence reordering! Super durable winter tyres especially on the back wheel which suffers punctures more frequently but this tyre minmises this. 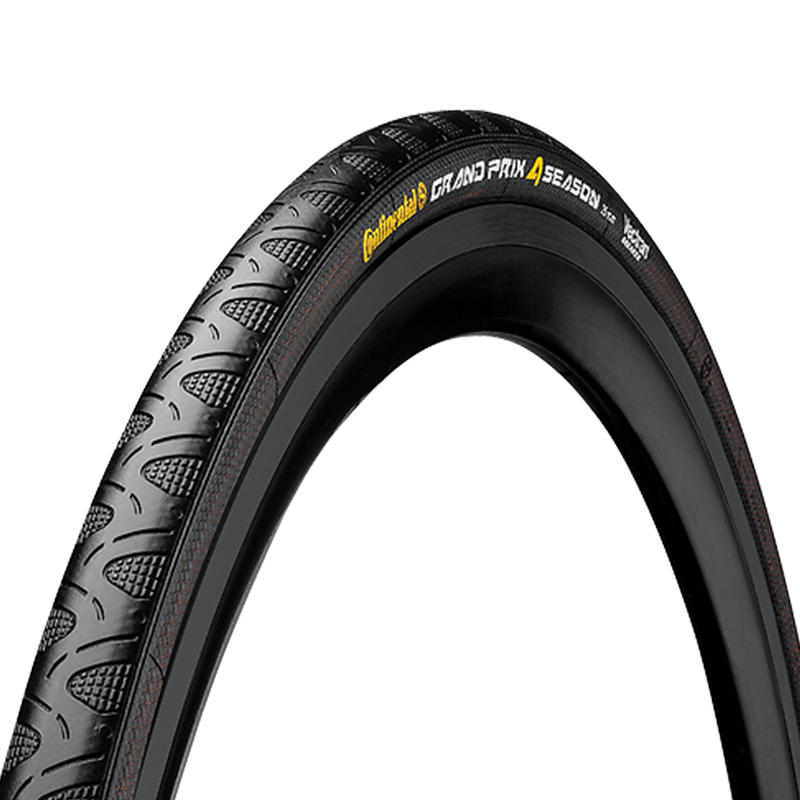 Great winter tyre from Continental. Superfast delivery from Merlin as always. Brilliant used these for the last few years, durable and other than a puncture on the first ride 3 years ago I've used these tyres for the last few winters with no issues at all. Fast and grippy too! best products deal, I am happy with Merlincycles online store, very efficient staff to proccess orders.